It is hard to say how well a contestants dial score correlates with there actual vote ranking. Last weeks elimination demonstrates this, with the lowest scorer not even being in the bottom three. If there is any value in the dialidol data it would appear the race is currently between Gokey and Lambert. It should be remembered that dialidol excludes text votes and only represents a certain type of voter, possibly towards the geekier/fanatical end of the spectrum as opposed to casual viewer. 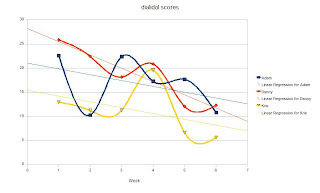 The following article casts further doubt on the validity of dialidol data. Tonights elimination will be interesting but I don't think I will be getting involved.